Baccarat became a casino game after traveling from Europe to South America and eventually making its way to the Dunes casino in Nevada. They were the first casino to offer Baccarat in the 1950’s, and now baccarat is played all over the United States and can now be found in online casinos as well. Playing baccarat is very simple. The only decision the player has to make is to bet on the player or the bank. Pick the right hand and you win. It just does not get any easier then that. 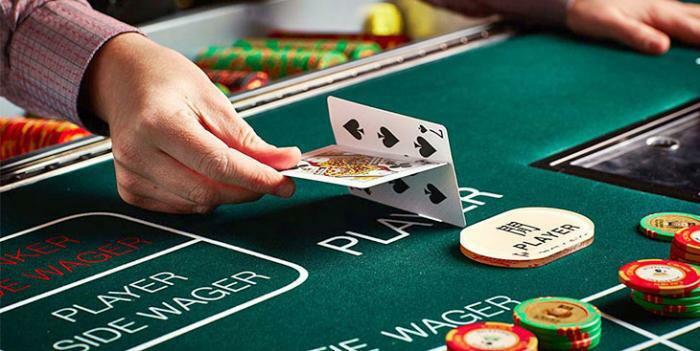 The game is won by points like Blackjack, but in Baccarat the player has no control over his or her hand. Here we explain the Classic version and Mini Baccarat rules that are common to most casinos online and land based in the USA and Europe. Scoring in baccarat is fairly simple if you can add and subtract. Numbered cards 2 thru 9 are scored at their face value. All face cards and 10’s are worth 0 points and an Ace is worth 1 point. In Baccarat you can not bust any hand that totals more then 9 you automatically subtract 10 points, so a 7 and a 5 would be worth 2 points. The hand with a total of 9 or the closest to 9 is the winner. Unlike in blackjack a Baccarat player makes no decision the rules determine the amount of cards you get. Any 2 card hand that totals over 6 does not get a 3rd card. A hand of 5 or less can receive 1 more card. If the first 2 cards dealt to the player or the banker receive total 8 or 9 that is called a natural a natural 9 is the best hand and beats any other hand. A hand of 3 cards totaling 9 can be beat by a natural 8. The house advantage is very low in baccarat, and anyone who bets on the bank’s hand also receives this advantage. That is why any winning bets on the banker are charges a small 5 percent rake to the house. Accounting for the 5 percent commission the house edge is only 1.37 percent. In some casinos betters can place bets on a tie at 8 to 1 odds while the actual odds are around 9 to 1, which raises the house edge to 14 percent. One of the reasons baccarat tables have very high minimum bets is for two reasons. The first is to keep out the rift raff and the second is because of the amount of floor space and personal required for each Baccarat table. Some casinos do offer smaller tables with minimums as low as 2 dollars. These tables follow the exact same rules and odds as the larger tables. The Game Baccarat was started in Italy in the middle ages. Baccarat soon became popular with the French Aristocracy. The game eventually spawned a 2nd version of the game called Chemin de Fer. Some experts have found evidence that in the original version of Baccarat Tarot cards were used. In modern American casinos the version of Baccarat played is the French Chemin de Fer. The games are identical with the exception that the bank is played by a player at the table and not by a casino employee. The casinos like this version because there is no risk to the house. They get a cut of all the winnings of the player acting as the bank, instead of having to pay someone to sit and bank for the casino and risk loosing. Baccarat become very popular outside the United States, and usually the biggest players are from the Far East. They sit is lavishly designed baccarat rooms made to look like Las Vegas. The hottest spot on the planet right now to play Baccarat is in Macau, which is a small country in the Hong Kong area. Macau is made up of a Peninsula and 2 Islands in the South China Sea. It was at one time colonized by the Portuguese, but is currently under the rule of China. Before you fly out there to play some baccarat you should be ready for the chaos you are going to find. They are not as organized in their casinos as in the USA. It is common for several players to bet on the same spot and dealers often get confused and as you can imagine fights break out often.